The International Space Station Alpha (ISSA) is a cooperative venture between the United States, Russian, Japan and the European Union to produce, by 2002, a semi-permanent outpost in Low Earth Orbit. The Space Station Alpha program consists of three phases. Phase I, which began with STS-60 in February 1994, will lay the groundwork for the construction of the space station which occurs in phases II and III. Americans and Russians will conduct spacewalks and practice space station assembly by adding new modules to the Russian space station Mir. The cost and value of the Space Station continues to be a major issue. "For the sixth straight year, the Senate on September 4  stopped deficit hawks from terminating the multibillion-dollar space station. The multibillion-dollar space station has gained a lot of support on Capitol Hill since 1993 when it survived the House by only one vote. NASA estimates that construction had cost $11.4 billion from 1985 through 1993, and that future construction costs through 2002 would be another $17.4 billion. Estimates vary, but President Clinton in 1993 projected total costs over the life of the station at $70.8 billion." 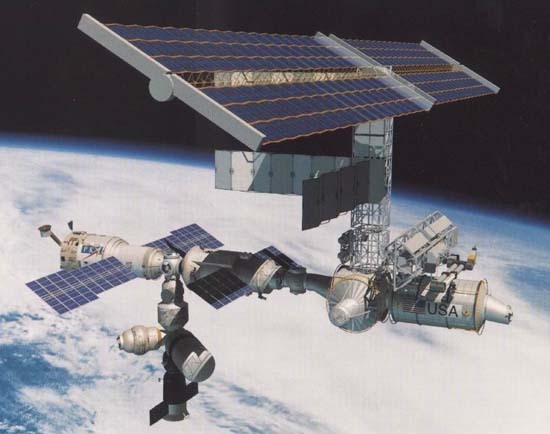 During Phase II, which is scheduled to begin in 1997, the core International Space Station will be assembled from U.S. and Russian parts and scientific research aboard the station will begin. Due to fiscal difficulties in the Russian Republic, the date to begin human occupation has been delayed six months. During Phase III (1999 to 2002), European, Japanese, Russian, Canadian and U.S. components will be added to complete the station and crews of docked shuttle orbiters will conduct research inside the station. When completed, Space Station Alpha would support 6 full time crew members for a planned operational lifetime of 10 years.